I made this card for my gorgeous friend Tania Tobin, who I have come to Auckland, New Zealand with for Onstage Live. I really wanted to give her a thank you card for sharing a hotel room with me, so here we have it...using this gorgeous butterfly bundle. 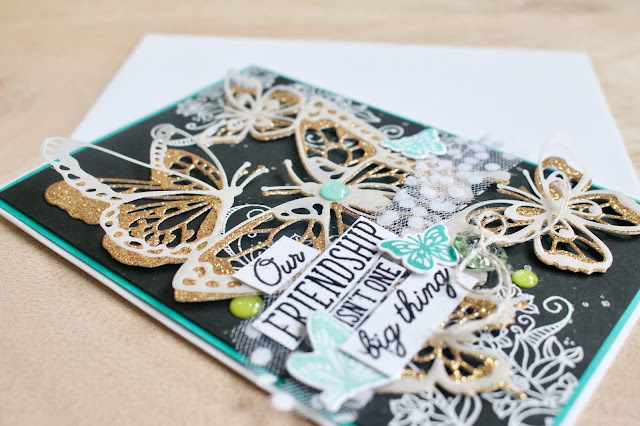 I loved layering the two butterfly ties in both a Gold Glimmer and Vellum layer, and love the glimmer and shine but also the softness this brings. 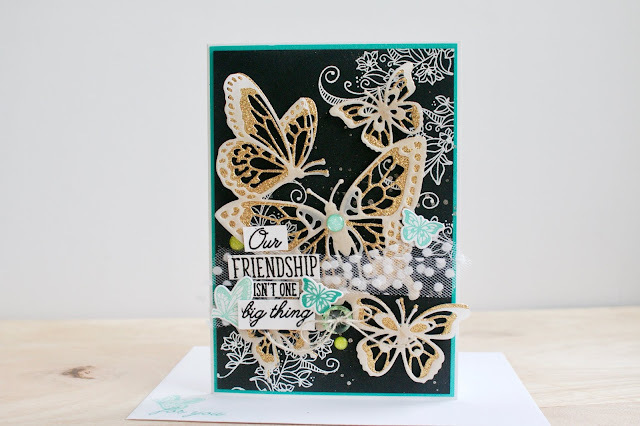 I heat embossed the Basic Black background with one of the coordinating stamps from the Beauty Abounds stamp set and heat embossed with white. I have embellished with some the Glitter Enamel Dots and some Spotted Whisper White Tulle.